Known for its tough, segmented skin, the La Plata three-banded armadillo is named for the three distinct bands at its mid-section. This small mammal weighs an average of 3 pounds and can reach 12 inches in length. This species is native to South America, where it can found from northern Argentina into Brazil and Paraguay. The species is near threatened. 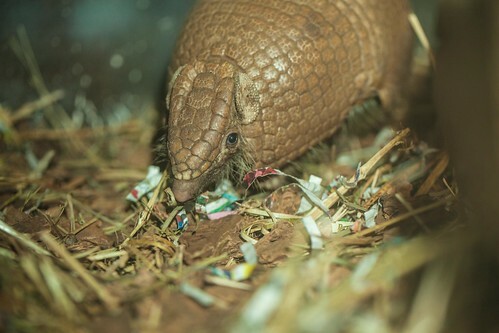 Lincoln Park Zoo participates in the La Plata Three-Banded Armadillo Species Survival Plan®, a shared conservation effort by zoos throughout the Association of Zoos and Aquariums. 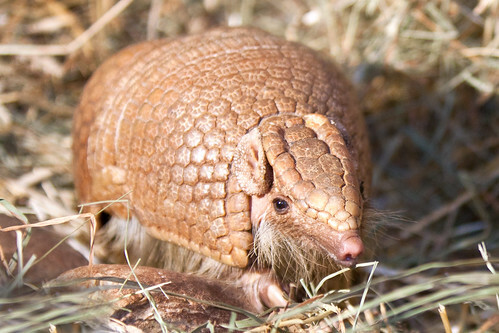 The La Plata three-banded armadillo typically inhabits grasslands, dry forests or savannas. 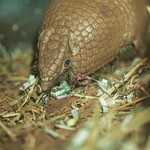 La Plata three-banded armadillos typically feed on ants and termites. They use their strong claws to dig up insects on which to feed. A long, sticky tongue helps the species gather its food. Individuals are solitary, coming together to breed. Single young are born after a gestation period of 120 days. They are born with their eyes sealed but are soon able to follow their mothers. 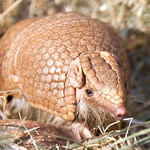 The La Plata three-banded armadillo can close its durable shell into an armored ball, protecting the species from predators. In its closed formation, the shell also retains heat, helping the species to stay warm.